Tragus piercing - Cherry Colors - Cosmetics Heaven! As you may know by now.. I love piercings. I have a couple of them on my wish list, but nothing visible (except the septum). So my dear got me my Xmas present which is a lovely tragus piercing. I was debating if I should get a dual lobe piercing or a tragus one.. Anyway I walked out of the studio with the tragus pierced. It's funny because I only came to the idea of getting my tragus pierced a couple of days before. I usually want my piercings for literally YEARS before I get them done. But because it's very pretty and subtle, I absolutely love it. The piercing process didn't hurt at all. If you are interested in the whole experience, you can read it here. 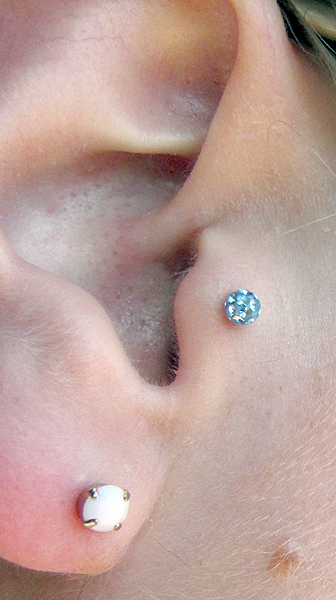 The tragus piercing is a perforation of the ear for the purpose of inserting and wearing a piece of jewelry. The tragus projects immediately in front of the ear canal. The piercing itself is usually made with a small gauge hollow piercing needle, and typical jewelry would be a small diameter captive bead ring or small gauge post style piercing jewelry. A related piercing is known as the Antitragus piercing. The hollow, low-gauge needle used for the piercing can be either straight or curved, depending on the piercer's preference. The piercer has to be careful not to allow the needle to penetrate any further than the tragus. Body piercers recommend about 12-18 months before changing the earring as it has a high risk of getting infected due to long hair getting caught around the earring, any hair product residue, or improper cleaning also swelling of the tissue can cause the earring to get caught in the skin possibly resulting in hospital surgery and removal of the tragus if the earring is replaced too early. The Tragus becomes very swollen and will bleed and ooze fluids for the first week. Proper cleaning and sanitization is crucial in the healing of this piercing. And now lets move to some pictures :)! I know you all love pictures. I am super happy with it. Now all I want from it is.. some happy healing time. Hopefully it will heal in a super fast time (not 18 months which is the max but something like 6-7 would be perfect). After a while I changed the front ball.